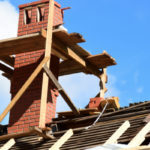 Tuck Pointing, Brick and Chimney Repair Toronto | Turnbull Masonry Ltd > Blog > Blog > How Does Masonry React In Toronto’s Weather? Canada is known for its diverse climate. It is this fluctuation between hot and cold that impacts masonry in a couple of ways. Different parts of Canada see different weather patterns, and as a result see different masonry issues too. Some regions are cold and dry in the winter, while other regions are cold and wet. Water is the number one culprit regarding masonry work. 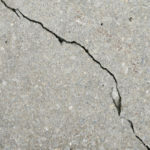 As a result, the parts of Canada that see considerable snow and rain during winter months have the most masonry issues. Thanks to Toronto’s southern location it is one of the dryer parts of Canada, meaning local masonry tends to last longer than masonry in other parts of the country. Yet again, during the summer Toronto is known to flood, which also contributes to masonry damage. 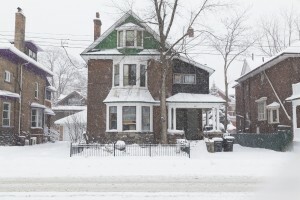 The first masonry problem caused by Canadian weather occurs during the winter when freeze thaw cycles take place. When water gets in between small gaps in masonry units it freezes when the temperature drops enough, this causes the water molecules to expand until there is no more room. This creates a pressure that actively deteriorates masonry until the temperature increases enough for the ice to melt back into water again. When this freezing and thawing cycle happens over and over damage begins to build up, eventually causing the face to spall off. Mortar joints are the exit points for water; these joints are constructed to take the brunt of water damage away from brick or stone. This is because mortar is much cheaper and easier to replace than entire bricks or stone slabs. A well functioning mortar bed is meant to break down over time, something has to and you’d rather it be the mortar than your brick or stone. When the bed becomes overworked and begins to break down it will eventually fail, putting masonry work in danger. 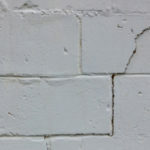 Identifying failing mortar joints early on will save you money as well as your entire masonry structure. When mortar joints fail they require what is known as repointing. 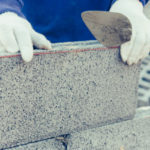 This process involves removing the broken down mortar joint, and replacing it with a mortar that is compatible in strength and color to the original. If repointing is not taken care of in a timely manner the entire wall or building is in danger of eventual collapse. Since Toronto does have some variance in seasonal weather it’s important to always check masonry work for signs of joint damage. The National Research Council conducted in-depth testing on buildings in Ottawa in order to document the exact impact the average Canadian winter has on masonry units and the mortar that holds them together. Results vary depending on a buildings exact location and the direction it faces. An average brick veneer wall facing in a southwest direction undergoes 100 freeze thaw cycles in an average winter. That means water expands and contracts within masonry joints 100 times in only one season! You can only imagine what type of damage this repetition can create over the span of a few winters. The best way to prevent water from getting inside of masonry next winter is to prepare ahead by making sure masonry joints are intact, efficient and properly sealed. The freeze thaw cycle isn’t the only thing Canadian weather has against masonry; deicers are another bad guy in brick town. If salts are used on your steps, driveway or entranceways, there is chance masonry damage has already had a chance to formulate. Due to capillary action, or the tendency for a liquid to rise or fall in relation to surface tension, the salt from deicers will absorbs into the bottom of a building. As a result, efflorescence will build up on the bricks creating an unattractive white stain caused by the salt crystals protruding from the pores of masonry. Salts may also contribute to more harmful masonry damage than aesthetics. Using salts on historic buildings is largely cautioned against as it contributes to quicker degradation of materials. Sand or salt alternatives are recommended near heritage buildings. Of course, since Toronto generally has less snowfall than other parts of the country the impact from deicers is decreased but still present, some winters more so than others. Toronto masonry doesn’t take the same beating as masonry in other parts of the country but it still requires extra special attention to detail. Masonry problems related to weather will eventually form no matter how long it takes. All masonry will require repairs at some point. The key to the longevity of any masonry structure is finding the right team to take care of your masonry repairs. Turnbull Masonry is the trusted source for Toronto masonry repairs, rebuilds and regular maintenance. Contact us today; we’d love to help make your masonry structure last a lifetime.